6. note that twitter window is associated to the newly dropped icon in the launcher. On my classic desktop panel, i have 2 webapps launchers in the gnome-panel. Chromium is my default browser. In the new unity based desktop mode, those webapps now appear nicely. The problem is that when i start my default web browser, unity highlights on the left one of my webapp launchers, instead of creating one for the browser itself. And worse.. once the browser is running, i can't start this webapp anymore as unity keeps raising the main browser instead. For the other webapp, it works as expected. This is a complex issue to solve correctly. The most correct implementation associates URI's with windows inside of bamf. Such that bamf's exported tree becomes BamfApplication -> BamfWindow ->BamfUri (currently called BamfTab and incomplete in source). To achieve this goal there are three primary components. The first is a BamfUriSource. This source is a class used by an application to export its known URI's over dbus to BAMF. The implementation details are not that important, however it is important that it be trackable (so if it crashes we can eliminate references to it) and that it provide two way communication. In short, it needs to tell the bamf daemon about all the uri's it has, and the bamf daemon needs to in turn be able to ask a bamf uri source to "show" a specific uri in its window. The third and final task is to hook this all into unity. This is relatively straightforward to do. By making a launcher shortcut that points to a uri rather than an application, unity can associate an BamfUri with it, watching when it opens and closes. When clicked, unity can call bamf_uri_show () on the proper uri, which will result in the window raising itself and flipping to the appropriate tab. Excellent. * Where to look: lp:bamf and lp:unity are the primary consumers. Thanks for the pointer Steve. And to confirm, there is indeed a problem upstream in that bamf can't tell the difference between two instances. Having a fix like described in the bug would help immensely. I'm leaving the Unity side of the bug open as a whishlist item to avoid getting more duplicates in the future. It is an important issue though, and one we definitely want to solve next cycle. Can someone provide the Chromium devs some indication that this patch does the right thing? Just got a mail from Evan asking for input and I've asked Neil to look at it. Any luck with this? Let me know if you need help, Jason can help point you in the right direction. Well, I'm looking the best way to implement it... In the current implementation bamf always tries to associate each window to its application, and since a chromium app and a chromium instance shares the same pid they are considered as the same application. Now, using the window class, it's possible to be more accurate, but what is the preferred behavior? I was thinking to just associate the window class to match to each application (or to a view); so when a new window is going to be matched, if it has not the same window class of a "matching application in the current implementation", it's considered as a new application. However this would cause that if two windows with different class will be ALWAYS considered as two different applications. This is good for me, but I don't know if there are situations where this could be considered as a bad thing (since it's a stronger discriminant than the ones currently used). PS: By the way to get this bug fixed in natty, chromium should be updated too. Versions before the recent nightlies of chromium 12 won't work! Natty will most probably have chromium 11, but if you can make it work for the current daily, i'll backport the relevant bits before release. anyway. In my case, my webapps don't share the same pid because i give each webapp its own --user-data-dir (but it's probably only me). I see in the desktop file of a regularly created webapp that it has "StartupWMClass=Chromium-browser", is that a problem for bamf? xprop shows the expected WM_CLASS though.. but it works only when the webapp is running, so i don't know how unity is supposed to know when to start a new instance or raise the existing one. just to be sure we understand the same thing: both desktop files have the exact same StartupWMClass. Only xprop is different, but apps have to be running so i don't know how you can do the right thing unless each desktop file has its own distinct StartupWMClass. But i know nothing about bamf, so i may be wrong. Oh, Damn... I misunderstood what you meant. Yes: this is a problem. I mean, not so much for making the default chromium instance to be seen as a different application compared to the launched apps, but just to associate to the chromium apps their real desktop file (and icons then). They will use their xwindow icon and details so. I guess we should patch chromium again to support the saving of the correct desktop file when generating it for an app. I've wrote a comment in the related bug issue ( http://code.google.com/p/chromium/issues/detail?id=20587#c33 ) but maybe we need to open a new issue, since that is now fixed. - everything else => copied vanilla. Yes that should be done. I'll give a look. Ok the bug, from the BAMF side should be now fixed (see lp:~3v1n0/bamf/wmclass-matching ). To fix completely it in chromium an app StartupWMClass should match its xwindow WMCLASS. Maybe it's not standard, but reasonable. If it can be considered, I could open a bug / branch. 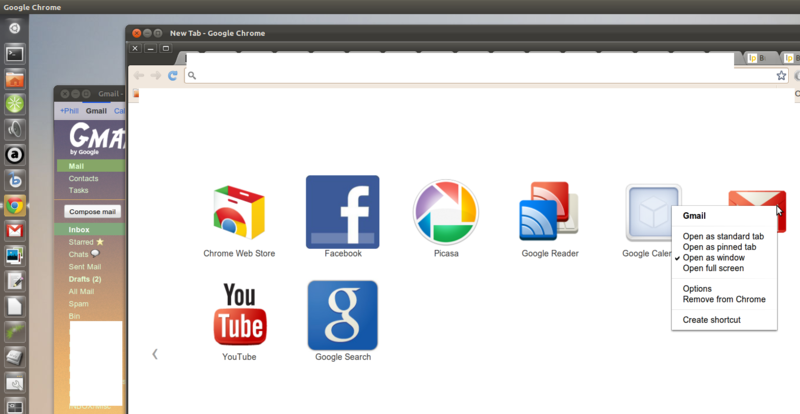 Just backported the chromium part from trunk to the stable branch. It's committed in my branch for Natty, and I've also updated the -stable PPA (it's currently building as 10.0.648.204~r79063-0ubuntu3~ucd~stable1). Please test before I release to natty. So it looks like that part's all set. -  Critical, CVE-2011-1301: Use-after-free in the GPU process. Credit to Google Chrome Security Team (Inferno). x-scheme-handler method of registering URI handlers in gnome3. * Report a dedicated WMClass per webapp, needed by Unity/bamf. Chromium must be fixed, it's just a one-line patch to invert the parameters to gtk_window_setwmclass, we should fix this in ubuntu quickly if chromium won't do it. The bug in chromium should be now finally fixed. Please, Fabien backport the new fix in chromium too. -  High, CVE-2011-1303: Stale pointer in floating object handling. -  Medium, CVE-2011-1305: Linked-list race in database handling. Credit to Kostya Serebryany of the Chromium development community. -  High, CVE-2011-1437: Integer overflows in float rendering. -  High, CVE-2011-1438: Same origin policy violation with blobs. -  High, CVE-2011-1440: Use-after-free with <ruby> tag and CSS. Credit to Jose A. Vazquez. -  High, CVE-2011-1441: Bad cast with floating select lists. -  High, CVE-2011-1442: Corrupt node trees with mutation events. Credit to Sergey Glazunov and wushi of team 509.
with navigation errors and interrupted loads. Credit to kuzzcc. -  High, CVE-2011-1447: Stale pointer in drop-down list handling. -  High, CVE-2011-1448: Stale pointer in height calculations. Credit to wushi of team509. -  Medium, CVE-2011-1434: Lack of thread safety in MIME handling. capture local files. Credit to Cole Snodgrass. interaction with X. Credit to miaubiz. reload. Credit to Jordi Chancel. processes. Credit to Julien Tinnes of the Google Security Team. * Fix the password store regression from the last Chromium 10 update. I have tested it little bit and it is not working for me. This confuses BAMF in fucntion bamf_matcher_possible_applications_for_window in file bamf-matcher.c. Yes, we know. My fix was overriding this when the WM_CLASS was different, but it was reverted after some time. I am confused by the updated description. Is the WM_CLASS we set not enough? I think the new description is out of scope for this bug. The scope of this issue is that desktop files using the --app mode of chromium should be able to be differentiated from the other chromium instances, which the WMCLASS flag should solve. The more general problem of matching any site or application running in a browser window or tab is another problem, and requires it's own separate bug to track the task. I recommend to stay focused on the specifc --app problem for now, as I can still confirm the issue here, running standard unity on natty, and the latest daily build of chromium. @Evan : It's sufficient to deal with --app mode only. It won't allow for more complex interactions with web apps. If a user already has a tab open in a browser mode chromium this will not be reflected back to the user. The --app parameter is now correctly related to the WM_CLASS, the issue is in BAMF that doesn't discern for different applications. My old fix was merged, but it was not considering some cases which lead BMAF to a crash (so it was reverted). There are some things related to this bug too. And mostly the libwnck bug which doesn't allow us to get the proper WM_CLASS resource name (but just the class name itself) . Due to that bug, I also made chromium badly implement the ICCCM standard, asking them to switch the res_name and the class_name (sorry, but it was the only way to get the relevant value using libwnck). I fix is needed for chromium, the new bamf only works with chrome atm. Sorry, not quite fixed yet. If you create a new application shortcut from the things installed on the chrome store the window matching works, but if you create one out side the store it still mixes it up with the web browser window, even if you close it and relaunch the web app again. Then select Desktop or application check boxes (either or or both will work), then click ok. It creates the shortcut but the new webapp is still matched as a Chrome window. If you close it and then launch it from the new launcher you just created the same thing happens. WM_ICON_NAME(COMPOUND_TEXT) = "Bug #692462 in BAMF: “unity confused with chromium web apps”"
_NET_WM_ICON_NAME(UTF8_STRING) = "Bug #692462 in BAMF: “unity confused with chromium web apps”"
It has reappeared for me too. Well, it never really was completely fixed to begin with. Prior to this week, the bug seemed fixed for one web app but with more then one, unity was still confused and grouped all of them under the same icon. flawlesly. But now it's all messed up again. > of them under the same icon. I think the fastest way to "solve" the problem is downgrading chrome if possible. This worked perfectly for me in the default Unity shell with Chrome 14. Updating to Chrome 15 broke it. Trevi55 in chromium issue #20587 indicated that this is a problem in BAMF in Ubuntu, so this bug should probably be reopened as affecting that project. this bug was never fixed, neither for chrome nor for chromium. The bug itself is in BAMF, so please set its status back to confirmed. Also, I've to say that the but had been fixed using the chromium-browser available in the oneiric/universe repositories (version 14.0.835.202~r103287-0ubuntu1), but it had not for recent chromium (like the 15.0.874.106~r107270-0ubuntu0.11.10.1 version that is in oneiric-proposed). I'm on chromium 17 and the problem stil persists. I can confirm that the bug still persists on Chromium 17 and unity (oneiric). See also https://bugs.launchpad.net/unity/+bug/939409 which is specific to Chrome and which higlights a clear regression since Oneiric. - Alt-tabbing works, each application is also separated into it's own workspace like normal apps. - Creating a new application shortcut from Chrome still classifies the application as Chrome when it is first created, I have to quit Chrome after creating it and then relaunch the app for it to show up. I'll bang on this for a few days to see if anything weird happens. Well done! > when it is first created, I have to quit Chrome after creating it and then relaunch the app for it to show up. I guess that this is more or less a race: probably chromium creates the new application window too early, when bamfdaemon has not matched the newly created .desktop file yet. Accepted unity into precise-proposed. The package will build now and be available in a few hours. Please test and give feedback here. See https://wiki.ubuntu.com/Testing/EnableProposed for documentation how to enable and use -proposed. Thank you in advance! I updated `unity`, `unity-common`, `unity-services`, and `libunity-core-5.0-5` to version 5.12-0ubuntu1 from precise-proposed, and this bug is still present. The actual change is in the `bamf` source package, which is not updated in proposed. I built bamf 0.2.116 from source, and that worked. Confirm what Kevin sees, this is a fix in BAMF. I'm using unity 2D (shell) I see the same as Kevin. the same as kevin... any possibility that bamf 0.2.116 will be avalaible as an update? the bug and does not introduce a regression. My SRU testcase points at BAMF and not unity so now I removed unity as affects from this bug and will wait for BAMF SRU canidate to get uploaded and accepted. @Omer it is true it doesn't work without bamf 0.2.116. I have that and it works, however I just tried a different branch of unity 5.12 and this fix broke. So it isn't all on bamf. Corey, the fix resides only in bamfdaemon... There are some unity and libbamf optimizations that affects even this, but the main fix resides in bamfdaemon itself. I'd like to add a hopefully useful data point. I've installed bamfdaemon, libbamf and libbamf3-0 version 0.2.116 from https://launchpad.net/~unity-team/+archive/staging/+packages on an up-to-date 12.04 AMD64 installation. 1. The new bamf indeed solves the problem where I start Chrome, and then application shortcuts. Each application shortcut gets its own icon, and similar app shortcuts are grouped in the Launcher. 2. However, if I start up an application shortcut FIRST, and then Chrome proper, that Chrome is then grouped together with the last started application shortcut icon. correction: In case #2, Chrome proper is grouped incorrectly with the FIRST started application shortcut icon, not the last. Accepted bamf into precise-proposed. The package will build now and be available in a few hours. Please test and give feedback here. See https://wiki.ubuntu.com/Testing/EnableProposed for documentation how to enable and use -proposed. Thank you in advance!